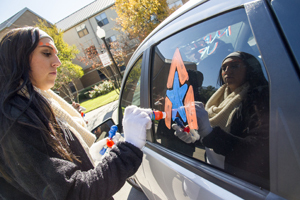 Car art: Volunteers braved cold weather Monday for the first event of Homecoming week. Paint Your Ride with Maverick Pride at Arlington Hall provided Mavs and UTA fans with a chance to show their spirit via their vehicle. Maverick Country welcomes students, alumni, and friends for Homecoming 2014, Monday-Saturday, Nov. 17-22. Enjoy the Chili Cook-Off on Wednesday and the Global Grounds Coffee Hour on Thursday. Find the beat at the Step Show on Friday before heading to The Bash, a dance party featuring DJs, music, thematic performers, aerialists, a light show, video sequences, and other surprises. Saturday is filled with the 5K run/walk and a golf tournament, followed by reunions. Head to the College Park District for the pre-game street festival at 3:30 p.m., cheer on the Homecoming parade at 5:45 p.m., and hoot and holler at the pep rally before the men's basketball game at 7:30 p.m.
Order Homecoming event tickets online. See the schedule and details for Homecoming 2014. UT Arlington has appointed Nan Ellin, professor and chair of the University of Utah Department of City and Metropolitan Planning, as founding dean of a new college that will be formed through the integration of the School of Architecture and School of Urban and Public Affairs. 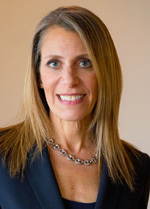 Dr. Ellin previously served at Arizona State University, where she directed programs in planning, urban and metropolitan studies, and a doctoral program in architecture and environmental design. She is the author of numerous books and articles. At UT Arlington, her first priority will be to shepherd the integration of the School of Architecture and the School of Urban and Public Affairs into a new college that will extend the reputation, impact, and influence of the University in areas related to design, architecture, urban planning, and public affairs. She officially joins UT Arlington on Jan. 5. Read more about Ellin's appointment. UT Arlington recently received a grant from the U.S. Department of Veterans Affairs for $57,488 under the Grants for Adaptive Sports Programs for disabled Veterans and Members of the Armed Forces. Funds were awarded to increase and expand adaptive sports opportunities for disabled veterans and members of the armed forces, allowing participation within the community, as well as at regional and national events. The grant will help the Movin’ Mavs Adaptive Sports and Recreation Program fund camps, clinics, and program participation costs for veterans with physical disabilities. Read more about the VA adaptive sports grant. UT Arlington has been selected to be part of the Terry Foundation Scholarship program, the largest private source of scholarships in the state. The program will help cover the full cost of attending college for 16 UT Arlington students. Unlike with most other educational aid programs, Terry Scholarships are not awarded solely on financial need, test scores, or grade-point average. Instead, students also must exhibit leadership abilities. The first class of Terry Scholars at UT Arlington will come from a pool of 32 nominees to be interviewed by the Terry Foundation in April. Sixteen students will then be awarded the scholarships beginning in fall 2015. Read more about the Terry Foundation Scholarships. 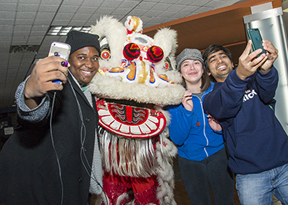 The star of the Dragon Dance posed for a selfie last week with, from left, Chigozie Izuogu, business information systems sophomore; Miriam Guerrero, criminology sophomore; and Mahesh Biyyala, computer science graduate student. The dance was part of the Cultural Extravaganza, an Asian Heritage Month event. The UTA Bookstore's latest sale is Tuesday-Wednesday, Nov. 18-19, and features a 25 percent discount on selected items and $50 off Dell laptops. Discounted items include fleece apparel, cold weather accessories, diploma frames, auto accessories, backpacks, totes, fashion bags, earbuds, headphones, and more. Make a child's holiday wish come true this season through the Salvation Army Angel Tree sponsored by the UTA Volunteers. Choose an infant to young teen to sponsor by yourself, with friends, or with your department. Adopt an angel by Wednesday, Nov. 26, in the Leadership Center in Suite B 160N of the lower level of the E.H. Hereford University Center. All gifts are due by Tuesday, Dec. 2. For questions, call the Leadership Center at 817-272-9220. 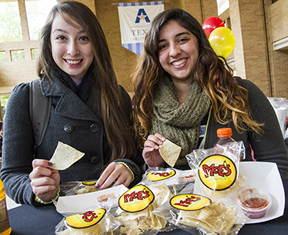 Cecilia Puga, left, business sophomore, and Mariana Navarro, nursing sophomore, enjoy chips and salsa at the grand opening of Moe's Southwest Grill, a new dining venue in the E.H. Hereford University Center. The Golden Key International Honour Society seeks your help to reach its goal of 2,000 pounds of food for needy families. Provide a box for your office donations and urge fellow students to bring nonperishable food items. Watson Building, 219 W. Main St. Donations are due by Tuesday, Dec. 2. For drop-off or pick-up details, contact Kevin Schuck at keschuck@uta.edu or 817-272-0102 or Micaela Seals at mlseals@uta.edu. All donations go to the Tarrant Area Food Bank. MavSwap Receive a free UTA T-shirt for your old college shirt. Free. 11 a.m.-1 p.m., University Center mall. Also, Wednesday, Nov. 19. UTA Ambassadors. Men's Basketball	Mavericks vs. Buffalo. Tickets $3 with student ID. 7 p.m., College Park Center. Athletics. Cuba: Histories of the Present David LaFevor, assistant professor of Latin American history and digital humanities, discusses photographs exploring daily life in modern Cuba. Free. Noon-1 p.m., sixth floor parlor, Central Library. Center for Greater Southwestern Studies. Homecoming Chili Cook-Off Free homemade chili with toppings, refreshments, music, and good time entertainment. Free. 12:30-1:30 p.m., University Center mall. Student Affairs. 'A Streetcar Named Desire' The Maverick Theatre Company presents a Tennessee Williams classic. Tickets $7 faculty, staff, students, seniors; $10 public. Box office 817-272-2669. 8 p.m., Mainstage Theatre. Also, 8 p.m. Thursday-Saturday, Nov. 20-22, and 2:30 p.m. Sunday, Nov. 23, Mainstage Theatre. Theatre Arts. UTA-HOSTS! 20th Anniversary Reception The peer mentoring program celebrates 20 years. Free. Noon-2 p.m., Palo Duro Lounge, E.H. Hereford University Center. Leadership Center. Homecoming Global Grounds This international coffee hour tradition features free spirit items, giveaways, music, and Blaze. Free. 4-5:30 p.m., Palo Duro Lounge, E.H. Hereford University Center. Multicultural Affairs, International Education. Homecoming Step Show Watch some of UT Arlington's fraternity and sorority members step the night away. Tickets $10 advance, $13 at door with student ID; $15 general admission; $7 children under 12. 7-10 p.m., Texas Hall. Fraternity and Sorority Life, Homecoming 2014. The Bash This dance party features DJs, music, thematic performers, aerialists, a light show, video sequences, and other surprises. Free refreshments, giveaways, and photos. Tickets $6 with student ID; $12 general admission. 9 p.m.-1 a.m., College Park Center. EXCEL Campus Activities, Homecoming 2014. Homecoming 5K Run/Walk This year's route is a scenic one through campus. Entries $15 with student ID, $20 others. 9 a.m., Maverick Activities Center. Campus Recreation, Homecoming 2014. Homecoming Street Festival Play games, enjoy food and beverage samplings, and a live DJ. Free. 3:30 p.m., Spaniolo Drive, outside of College Park Center. Homecoming 2014. Homecoming Parade and Pep Rally See large floats, marching bands, special guests, and traditional decorated golf carts. It all winds up with a pep rally. 5:45 p.m., Moritz Plaza. Homecoming 2014. Men's Basketball Mavericks vs. Houston Baptist. Tickets $3 with student ID. 7:30 p.m., College Park Center. Athletics. Deck the Mall Welcome the holiday season with music, hot chocolate, and lighting up the Library mall. Free. 6:30-10 p.m., Library mall. EXCEL Campus Activities. Women's Basketball Mavericks vs. Northern Arizona. Tickets $3 with student ID. 7 p.m., College Park Center. Athletics. Planetarium The fall schedule includes Astronaut; One World, One Sky: Big Bird's Adventure; Pink Floyd;Spacepark 360 Infinity; Two Small Pieces of Glass; and We Are Astronomers. Planetarium. Moving Beyond the Spectrum Lindsey Anderson discusses the NeuroQueer Project, which challenges cure-centric models of autism and embraces multiple, intersecting identities. Free. 5:30 p.m., sixth floor parlor, Central Library. Disability Studies, Office for Students with Disabilities, Women and Gender Studies. Business Plan Pitch Competition Students have 12 minutes to pitch an idea to experts for a chance to win $1,000 plus professional advice for launching their venture. 2-4 p.m., sixth floor parlor, Central Library. Business. Biology Colloquium Adam Leaché of the University of Washington is guest speaker. Free. 4 p.m., Room 118, Life Science Building. Biology. Engineering Speaker Series Ali Erdemir of Argonne National Laboratory discusses "Facing the Hard Truth about Friction and Its Impact on Global Energy Consumption." Free. 6 p.m., Room 100, Nedderman Hall. Engineering. Transgender Day of Remembrance Screening of film Boys Don't Cry, Rated R, followed by a candlelight vigil. Free. 6-8 p.m., sixth floor parlor, Central Library. LGBTQA Program. Chemistry and Biochemistry Speaker Series Boniface Fokwa of Aachen University in Germany discusses "Understanding and Designing New Magnetic Materials.” Free. 3 p.m., Room 112, Chemistry Research Building. Chemistry and Biochemistry. Management Lecture Series Laszlo Tihanyi of Texas A&M University discusses "The Governance Drivers of Competitive Actions." Free. 2 p.m., Room 609, Business Building. Business. Kinesiology Lecture Matthew Brothers of UT Austin presents “Impaired Microvascular Control in Populations with Elevated CVD Risk." Free. Noon, Lone Star Auditorium, Maverick Activities Center. Kinesiology. Management Lecture Series Daniel Armanios of Stanford University presents “Is Policy Enough? Understanding the Government Sector in the Midst of Reform.” Free. 2 p.m., Room 609, Business Building. Business, Management. The women’s basketball team has won its first two games of the season for the first time since 2006. The Mavericks trounced Missouri Valley College 90-32 Friday evening in College Park Center. The 58-point margin of victory was the largest for a season opener in school history. On Sunday, UTA placed four players in double figures in an 83-73 win over Houston Baptist at College Park Center. Next up for the women is a road game Saturday, Nov. 22, at Wichita State. In men’s action, the Mavericks won their season opener 86-75 Friday night against Bradley in Peoria, Ill. UTA hit 12 three-pointers, led by three each from senior Jamel Outler and freshman Kevin Hervey. The men face Buffalo at 7 p.m. today, Tuesday, Nov. 18, in College Park Center. Tickets are $3 for students. The volleyball team dropped a 3-0 decision Friday at Louisiana-Lafayette but rebounded for a 3-0 victory Sunday afternoon over Georgia State at College Park Center. In Sunday’s Senior Day win, Briana Sharratt led the way offensively as the sophomore middle blocker recorded a team-high nine kills to go along with a .600 hitting percentage and six blocks. The Mavericks are 23-8 overall and 13-6 in the Sun Belt Conference, good for fourth place. Their final regular-season match is at Georgia Southern on Friday, Nov. 21. The men placed sixth and the women 11th Friday at the NCAA South Central Cross Country Regional Championships in Fayetteville, Ark. It was the best regional showing by the men’s team in more than a decade. For the men, junior Craig Lautenslager finished 14th and junior Eric Ojeda was 23rd. Both runners earned all-region honors. In women’s action, junior Gabriela Alfonzo was the top finisher for the Mavericks, placing 26th. Senior Hannah Nilsson also cracked the top 50, coming in 42nd. Upcoming entry deadlines for intramural sports include innertube water polo, Sunday, Nov. 23; MavStrong, Wednesday, Dec. 3; and CollegeFB Bowl Pick 'Em, Saturday, Dec. 13.